Armoy Motorcycle Road Racing Club are delighted that Davie Wishart from Torquetronix will return as the Superbike Open Race sponsor in 2018 for the fourth year. 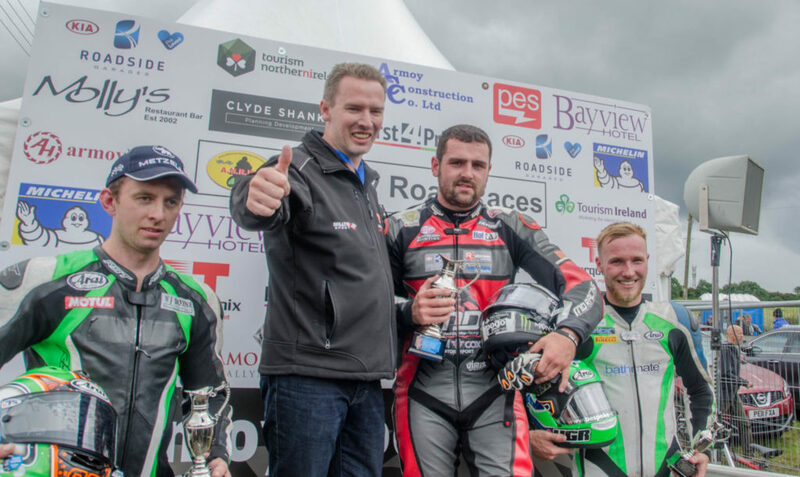 Last year the Open Race was won by Michael Dunlop on his BMW MD racing machine closely followed by Derek Mcgee and newcomer Davey Todd who finished in third place. Torquetronix is a bespoke tuning company that offers tailored performance tuning of the highest quality for Car and Motorbike engines is based in Kells, County Antrim and Davie believes that sponsoring the Open races is a great opportunity for them to strengthen their ties with performance and racing machines. Owner of Torquetronix, David Wishart, said “When I was first approached about sponsoring a race it was very easy to say yes to Bill Kennedy and his team. I’ve attended both the NW200 and the Ulster Grand Prix for many years but there is something about the Armoy Road Races that, regardless of whether the sun is shining or not, you know you are going to a great event where you will see something special. “This is a great opportunity for my company Torquetronix and I to become involved in road racing at a different level. The company has been up and running for some 15 years and specialises in performance remapping and chip tuning upgrades to engines for European vehicles. “We are a little bit different to the majority of tuning companies in that we actually write the software and customise it to the vehicle before testing it on the Dyno. This ensures that the car is recalibrated allowing for better performance, driveability and fuel economy. Of course we do tune motorbikes but the mainstay of the company is tuning a vast array of cars for customers from as far away as England and the RoI.